Soft fabric-covered cap surrounds, protects and soothes with our exclusive Gel. Absorbs pressure and friction while releasing mineral oil to soften and moisturize skin. 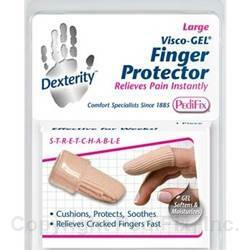 Relieves cracked fingers fast! 1 per package. Wash and dry affected area. Slip over finger and position as needed. Test for comfortable fit. Remove and trim as necessary. Do not place over an open wound. If irritation, discomfort or poor circulation occurs, discontinue use and notify your physician. Remove for at least 3-4 hours daily to allow skin to breathe.